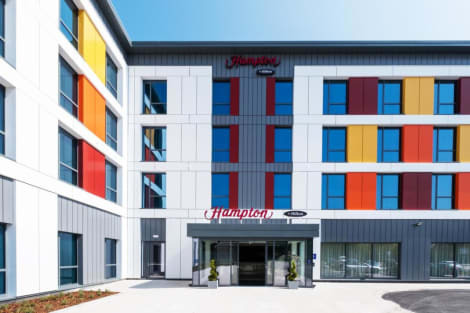 With its modern amenities and excellent suburban location, Hampton by Hilton Aberdeen Westhill is an excellent choice for business travelers and leisure guests. Our Westhill hotel offers easy access to Union Square shopping and entertainment. Free onsite parking is available. Codona's Aberdeen Fun Beach is only 30 minutes away by car from our hotel.Relax in your comfortable guest room and watch a flat-screen TV, or surf the web with free WiFi. Every room at our Aberdeen Westhill hotel features modern decor, a work desk, power shower and air conditioning. Select a room with a sofa bed, ideal for families or small groups.Wake up each morning to Hampton’s free hot breakfast and enjoy a snack at any time of the day from our 24-hour convenience shop. Keep on top of your exercise routine in free 24-hour fitness room or stay productive in our work zone. lastminute.com has a fantastic range of hotels in Westhill, with everything from cheap hotels to luxurious five star accommodation available. We like to live up to our last minute name so remember you can book any one of our excellent Westhill hotels up until midnight and stay the same night.